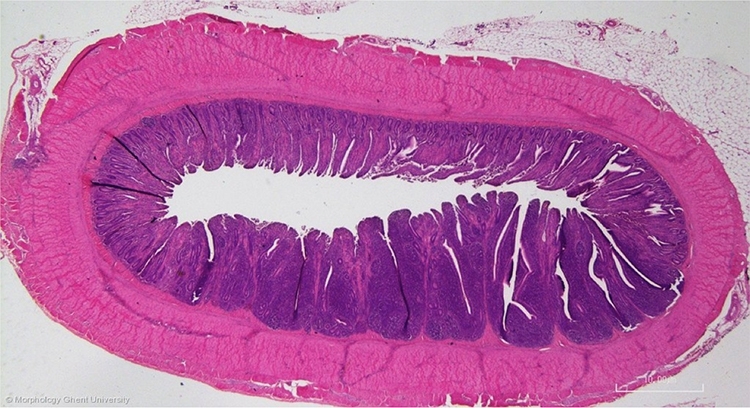 As in mammals, avian Peyerâ€™s patches or intestinal tonsils (lymphonoduli aggregati intestinales) are aggregations of lymphoid nodules in the lamina propria that also infiltrate in the tela submucosa. The primary and secondary follicles consist of mainly B lymphocytes, the interfollicular tissue contains mostly T lymphocytes. The overlying surface epithelium is transformed into a lymphoepithelium of cilindric cells without microvilli and infiltrated lymphocytes.